Poster: Don't forget the walls have ears! Fougasse was art editor of the magazine Punch at the outbreak of the Second World War in 1939. He offered his services free to the British Government and produced propaganda material for almost every ministry. His gossiping cartoon characters injected welcome humour into propaganda posters in February 1940 - their popularity set a new tone for official mass communication. 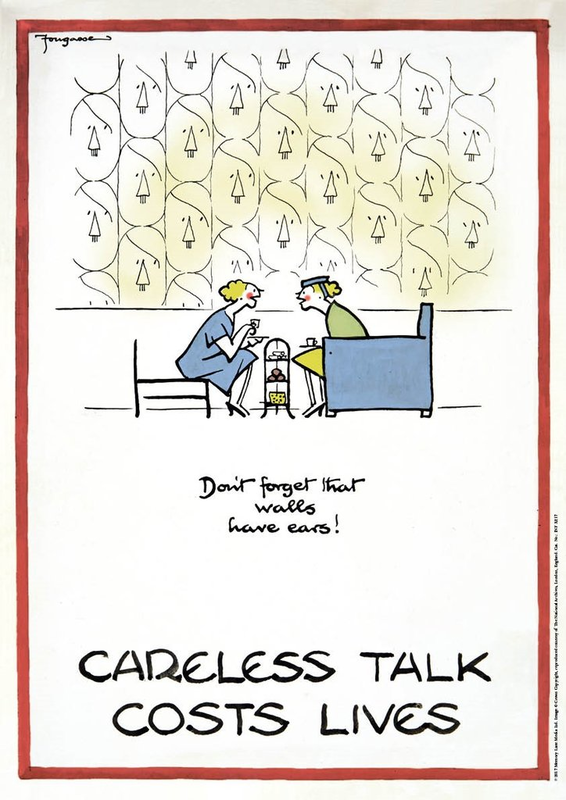 Despite an extended and illustrious career as a cartoonist, illustrator and commercial poster designer, it is probably for his 'Careless Talk Costs Lives' posters, issued by the Ministry of Information for display in public transport, that he is best known. In this one the Adolf Hitler (the hated German Nazi leader) wallpaper motif provides a visually amusing graphic device for concealing the enemy, as well as enriching the joke.